Trees are so much part of our landscape that they are often taken for granted. Only a few hundred years ago woods and forests were more vital elements in every day life as they provided food, fuel and timber for building and making everything from beds to bows and arrows. Our ancestors knew their trees, information most of us have now lost. 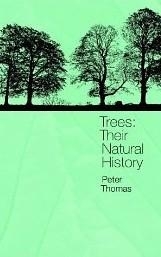 Peter Thomas, in Trees: Their Natural History restores this lost understanding and provides a much needed general introduction to how trees as living organisms (work, grow, reproduce and die) for the non-professional reader. Peter Thomas is a lecturer and researcher in environmental science at Keele University and reminds us that trees, like animals, face a constant battle in competing for light, water and minerals. In this natural history, he tells many fascinating stories about how trees cope with the diversity of global environments and the problems of being large and long-lived. Botanically, trees are not just one particular group of plants but a form of growth which has been adopted by many different groups of plants over the last 380 million years and many of them are now extinct. Today most trees are either conifers and related ancient groups such as theGinkgo or flowering plants. There are also a few surviving tree ferns which originally formed some of first forests on Earth and whose remains contributed to our coal deposits. The tree form of the flowering plants is the most varied ranging from the dwarf Arctic willow which barely grows above the ground to tropical palms and the strange grass trees of Australia.